The SPYNEL thermal imaging technology provides unique panoramic detection, identification and tracking of multi-target airborne threats like UAV swarming simultaneously. Field-proven, SPYNEL-S’s VLRF option is integrated into one single sensor head; the visible and infrared cameras as well as the Laser Range Finder enable for both a better threat identification and the measurement of its exact distance. Ideal for detecting UAVs flying over critical infrastructures, SPYNEL S-VLRF is a rapidly deployable solution and offers HD playback capabilities very useful for forensic analysis. Unlike radars, it is an undetectable fully passive solution, allowing to detect any type of threat day and night. Drone flyovers are often targeted to collect critical information over large areas. To secure them, multiple security sensors are often requested. 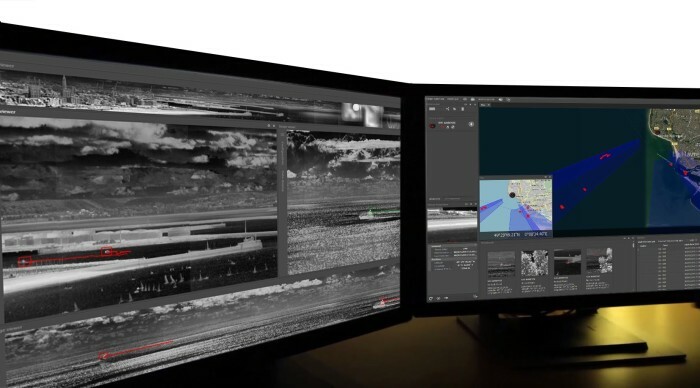 The brand new CYCLOPE Hypervisor is HGH’s proprietary remote supervision solution to monitor on one single GUI all the threats detected by multiple SPYNEL 360° IR cameras deployed over one or several critical infrastructures. Using a low bandwidth, CYCLOPE Hypervisor centralizes all alarms and videos and can operate in full coordination with one or several remote-control centers. Typical applications include critical infrastructure protection, airport surveillance, coastal surveillance, VIP procession and border surveillance.